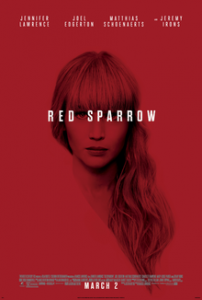 Red Sparrow is a 2018 American spy thriller film directed by Francis Lawrence and written by Justin Haythe. The film stars Jennifer Lawrence, Joel Edgerton, Matthias Schoenaerts, Charlotte Rampling, Mary-Louise Parker, and Jeremy Irons. It tells the story of a Russian intelligence officer who is sent to make contact with a CIA agent in the hope of discovering the identity of a mole. Author Matthews, a former member of the CIA, advised the production on the depiction of spying. Red Sparrow premiered at Newseum in Washington, D.C. on February 15, 2018. The film grossed $151 million worldwide and received mixed reviews from critics. If you like Russian espionage, maybe mixed with some dangerous, forbidden love, check out these fictional spy novels. Russia's attempts to destabilize Ukraine's fledgling democracy are countered by Cougar - a private intelligence company enlisted by the CIA - in whose employ ex-KGB officer Anna Resnikov risks danger to rid her homeland of a resurgence of Russian influence. When the Moscow Station is left in ruins after a major intelligence breach, CIA analyst Jonathan Burke and agent Kyra Stryker are fast on the trail of Alden Maines, an upper-level CIA officer whose defection coincides with the murder of the director of Russias Foundation for Advanced Nuclear Research. A triple murder in a Moscow amusement center: three corpses found frozen in the snow, faces, and fingers missing. Chief homicide investigator Arkady Renko is brilliant, sensitive, honest, and cynical about everything except his profession. To identify the victims and uncover the truth, he must battle the KGB, FBI, and the New York City police as he pursues a rich, ruthless, and well-connected American fur dealer. Meanwhile, Renko is falling in love with a beautiful, headstrong dissident for whom he may risk everything. In corrupt Russia, an erratic Vladimir Putin is determined to forge his country into a formidable superpower once again. He intends to redraw the map of Europe and will go to impossible extremes to realize his fantasies - including shooting down a civilian airliner packed with tourists bound for China. Kremlin scientists have developed a radical new weapon that could forever alter modern warfare. NATO, locked in a tense standoff over Ukraine, Poland, and Estonia, knows Putin will not hesitate to use it. But there is one man who can bring the world back from the brink: Britain's foremost intelligence asset, Lord Alexander Hawke. When the Great Depression hits, Florence Fein leaves Brooklyn College for what appears to be a plum job in Moscow—and the promise of love and independence. But once in Russia, she quickly becomes entangled in a country she can't escape. Many years later, Florence's son, Julian, will make the opposite journey, immigrating back to the United States. His work in the oil industry takes him on frequent visits to Moscow, and when he learns that Florence's KGB file has been opened, he arranges a business trip to uncover the truth about his mother, and to convince his son, Lenny, who is trying to make his fortune in the new Russia, to return home. What he discovers is both chilling and heartbreaking: an untold story of what happened to a generation of Americans abandoned by their country. View more suggestions for Red Sparrow.